Colleges campuses around the United States have been protesting their schools’ investments in top 200 fossil fuel companies. This fall, Lehigh’s Green Action club protested on the UC Front Lawn urging the board of trustees to reduce the amount of fossil fuel companies Lehigh invests in. While the protests gained attention and momentum from students and faculty, the endowment in those companies has remained the same. Andrew Goldman ‘19, the activism chair of the Green Action club, said the relationship between Green Action and the administration can be frustrating at times. “The administration kind of sends us on a little goose chase,” Goldman said. Another Green Action club member, Gabrielle Pomerantz, ‘18, said although no real divestment change has been made, the administration has showed it is receptive to the club’s cause and is willing to work with its members. Goldman said the club looked to Lehigh’s own Principles of an Equitable Community as the primary reason to divest in fossil fuel companies. Green Action argues that the change is fundamental to Lehigh’s standards based on what is stated in the university’s principles. Green Action has created a comprehensive document outlining what changes it would like to see in Lehigh’s investments to present to the administration. One of the issues Green Action has faced has been poor student support. Pomerantz said she believes this is due to the complexity of the issue itself. “It seems like divestment is not a super salient thing at the top of people’s minds,” Pomerantz said. Another challenge has been the administration’s lack of change when it comes to divestment. Goldman believes the reluctance to divest is due to a fear of hurting Lehigh’s relationship with the fossil fuel industries. In the past, these large companies have provided students with internships and jobs, as well as given donations to the school. Goldman said Lehigh is concerned about the short-term effects instead of the overhauling long-term impact fossil fuels have on the environment. “If you know climate change is coming and you are still willing to invest for the short-run profits in a long-term problem, that is an issue for the future,” said Al Wurth, a professor in the political science department and the Green Action adviser. The biggest goal of the Green Action club is to make the Lehigh community more aware of the impact pollutants have and will continue to cause. In regard to saving the planet from detrimental pollutants, Pomerantz said the benefits of divestment outweigh the initial costs. Members of Green Action have been working on several other campaigns, such as eliminating Styrofoam on campus, holding an event called Peace Fest and organizing a bus to the People’s Climate March in Washington, D.C. this past weekend. Goldman said for Lehigh’s divestment to become reality, it needs a lot of support from students and faculty. Green Action hopes its smaller events will help grow membership, so it can continue on its fight against fossil fuel investments. 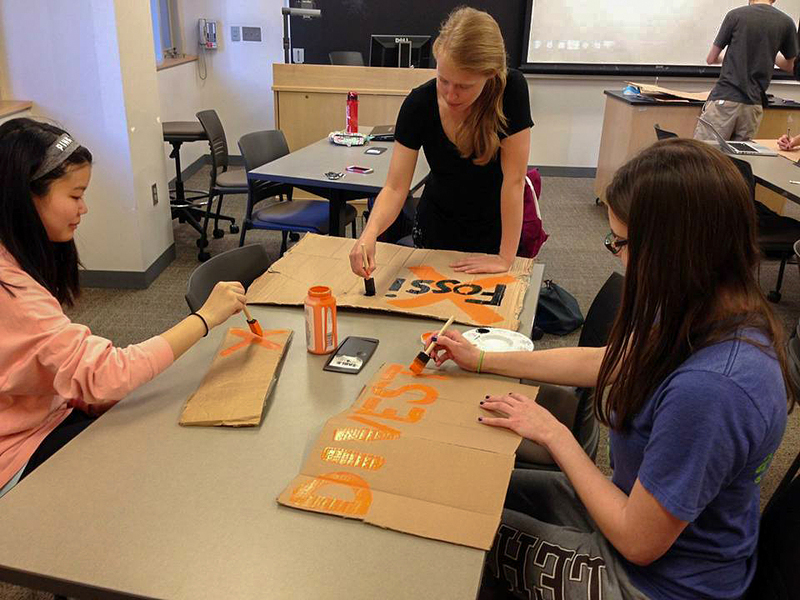 “We decided to put divestment on the back burner in order to grow our organization. Once we get that really strong network we will come back and say, ‘We have the support of the student body, it is in your own documents, you need to do something about it,’” Goldman said. Wurth said if enough students come together and say they want to divest, the real question would still be whether the board of trustees would eventually respond.